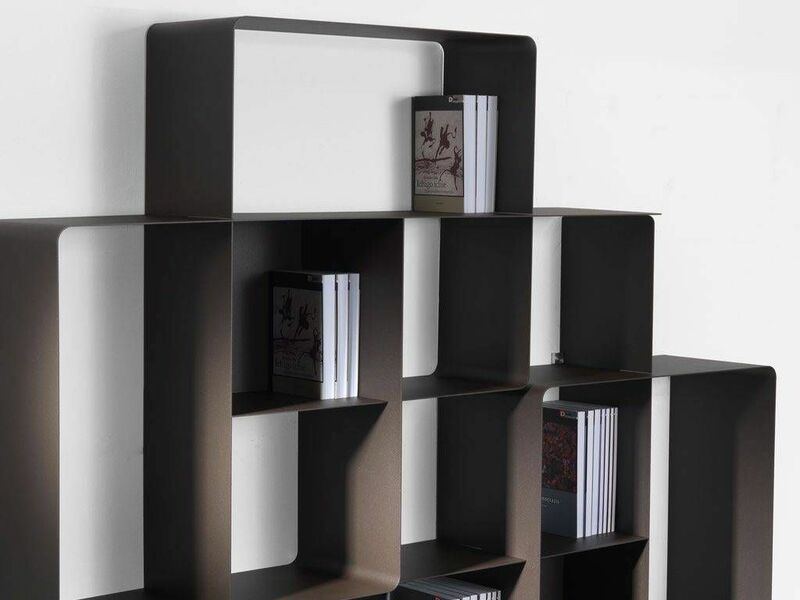 Last 396 items in stock! 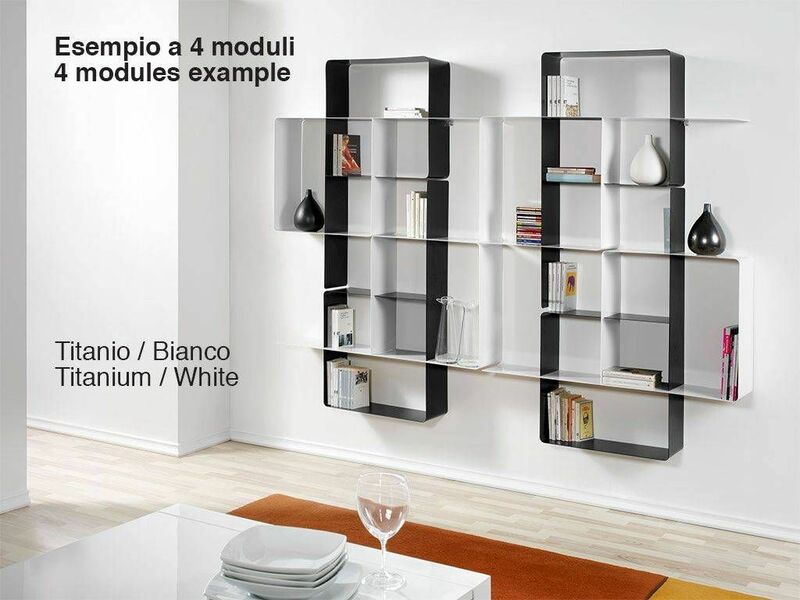 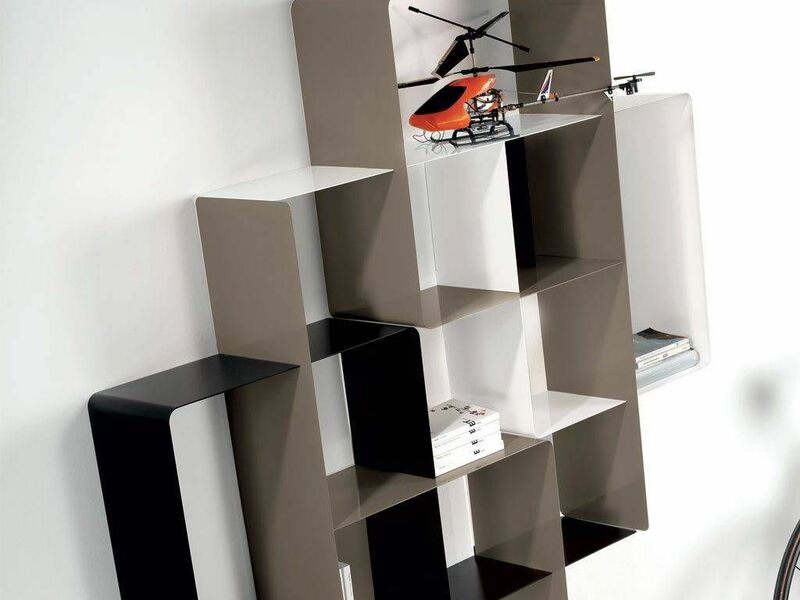 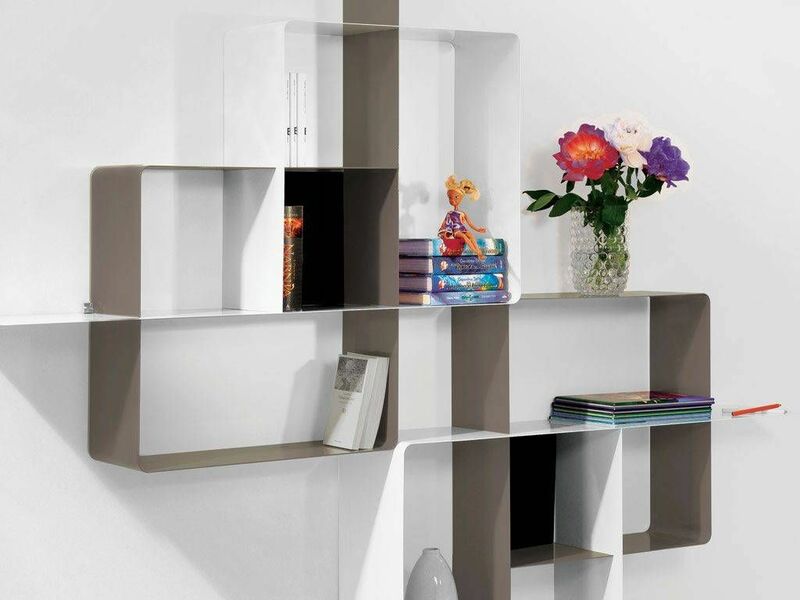 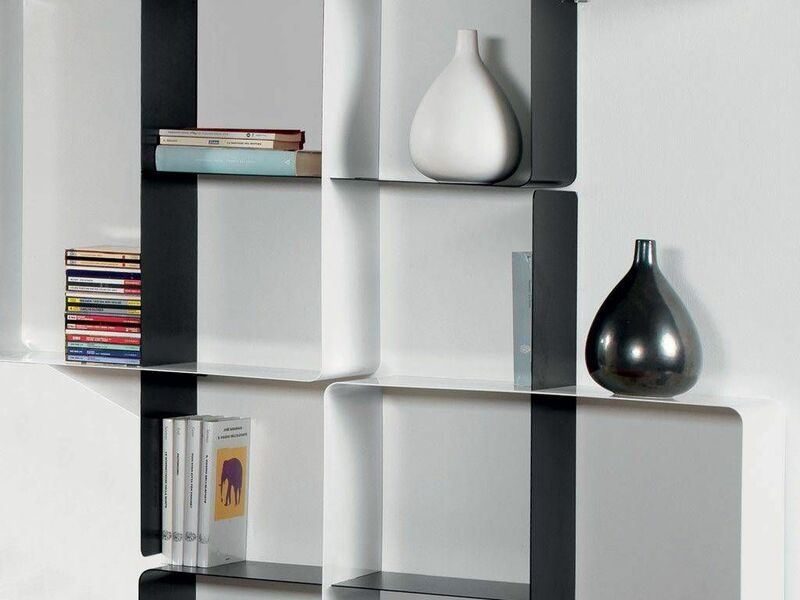 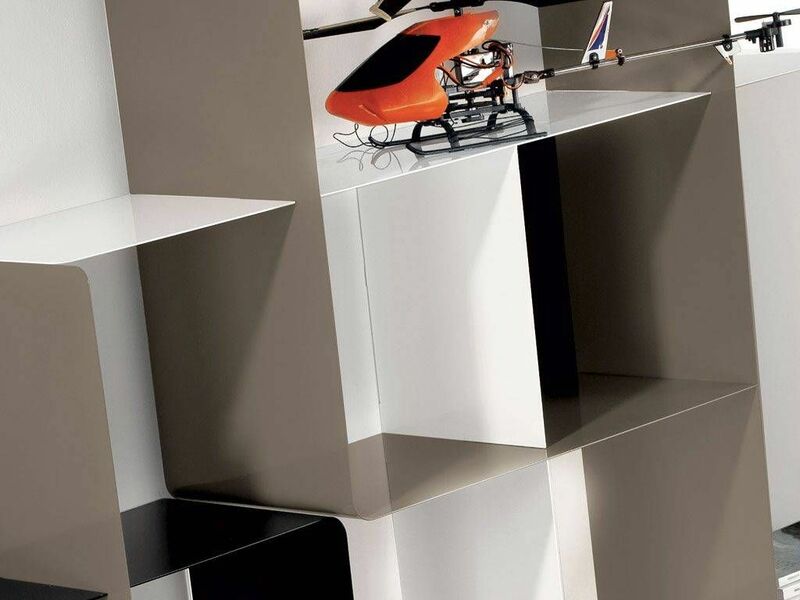 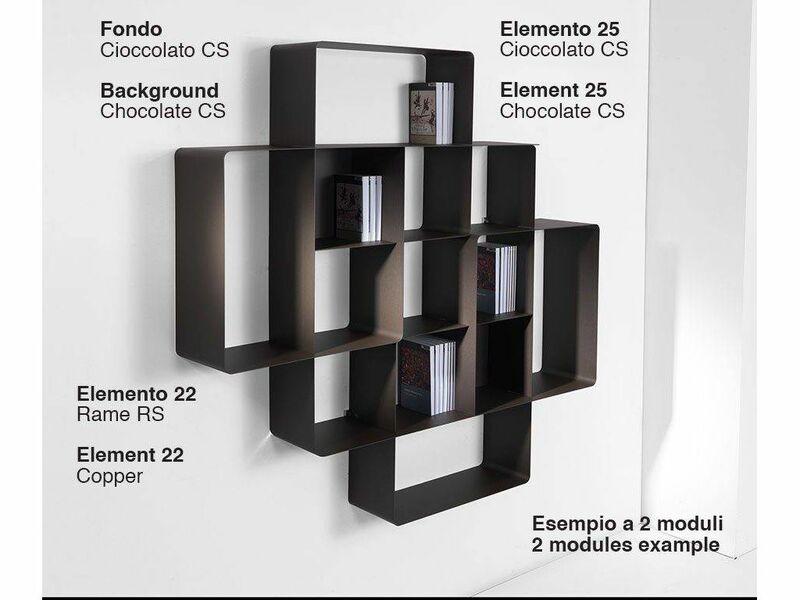 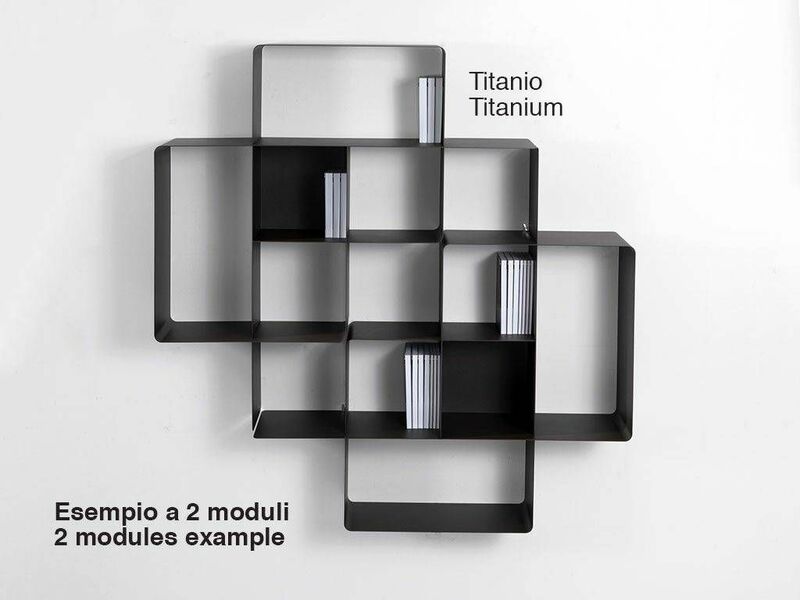 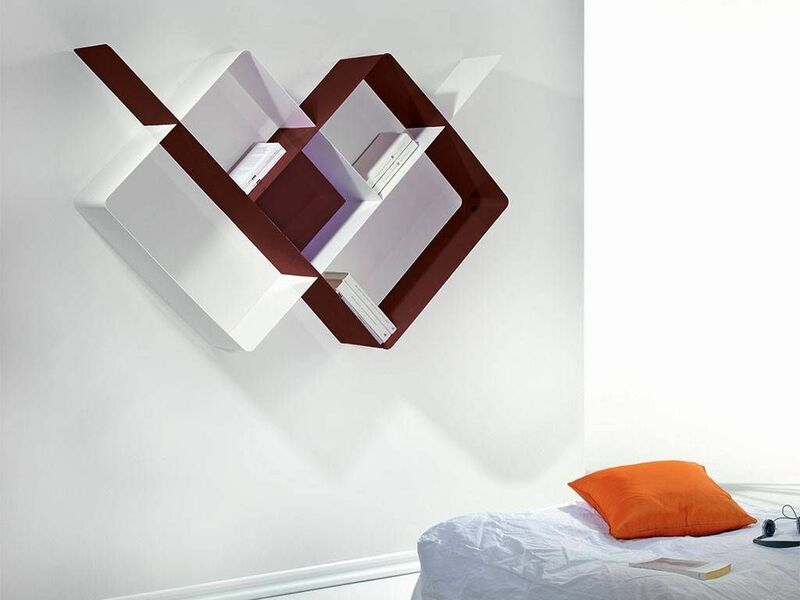 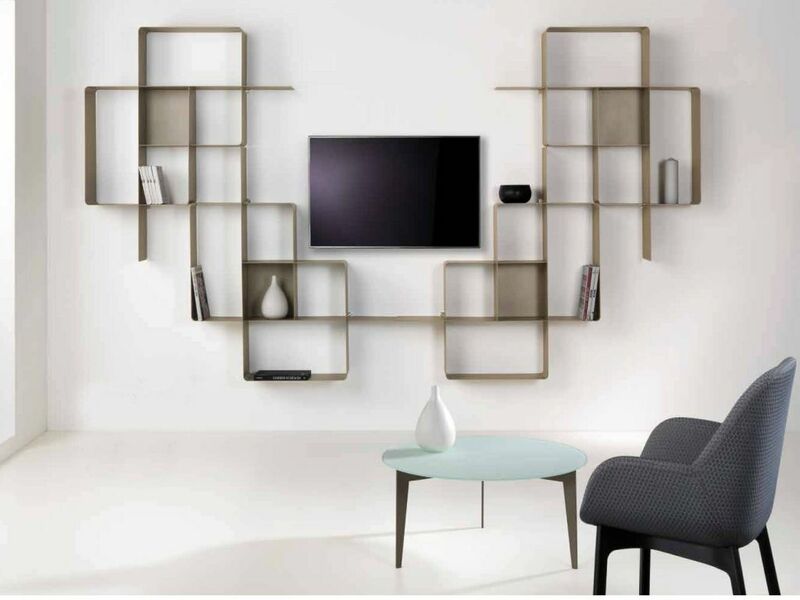 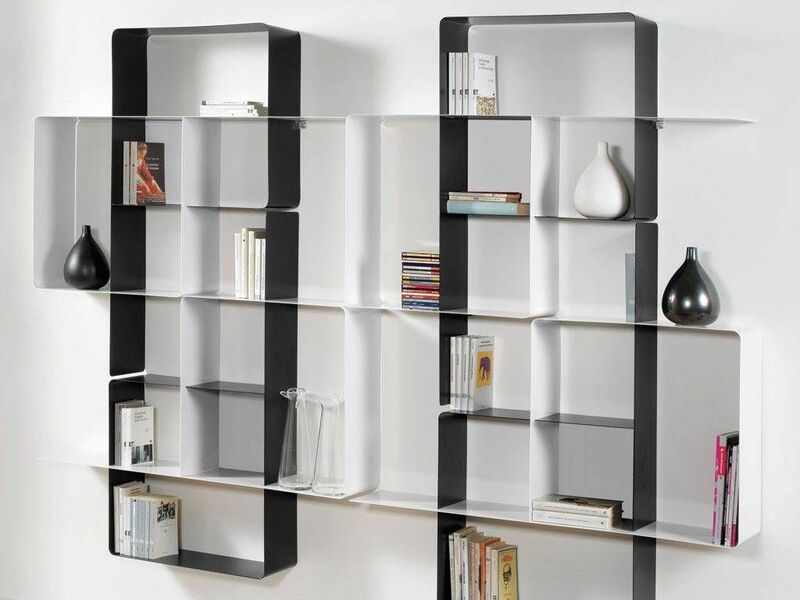 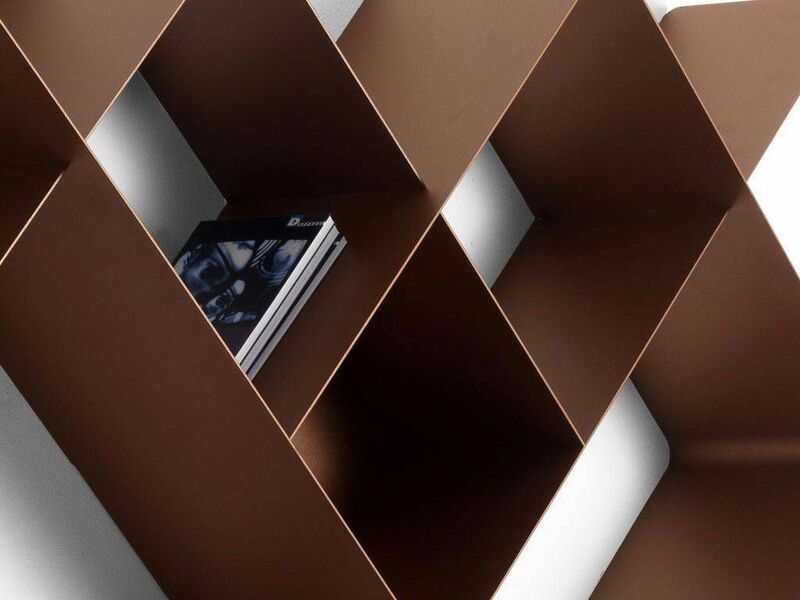 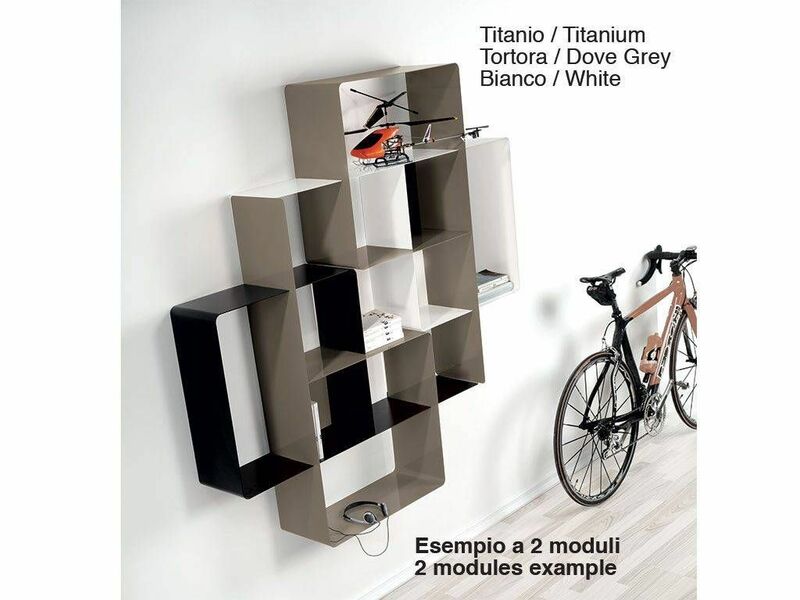 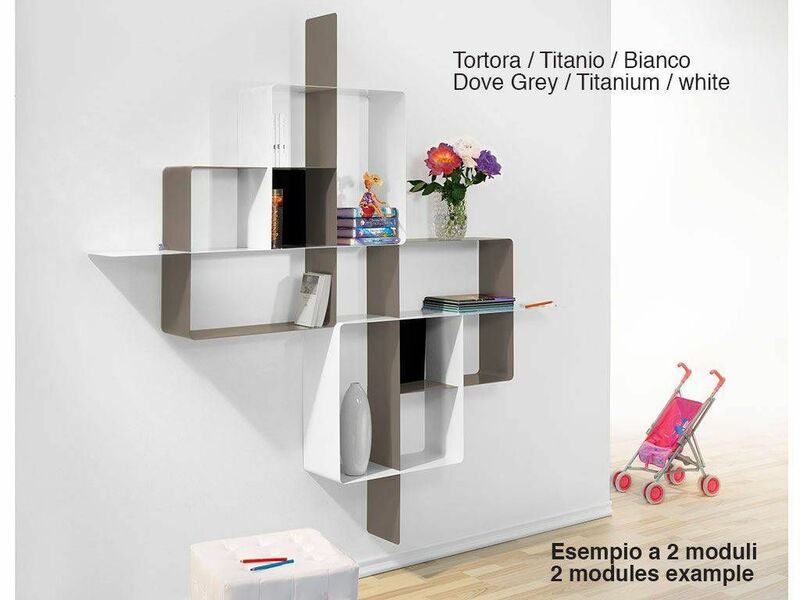 Innovative modular bookcase composed of 2 elements (specular and interlocking) with different depth, cm. 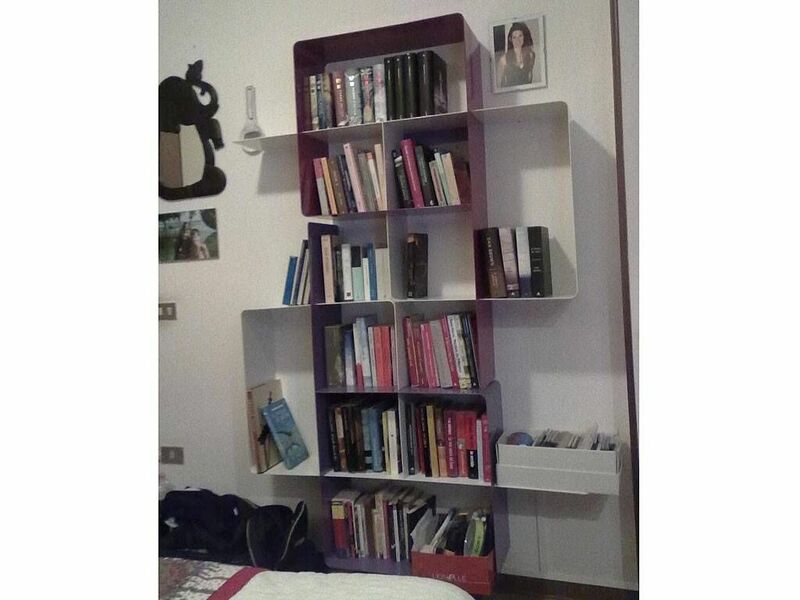 25 and 22 and a coloured background in the middle of the bookcase. 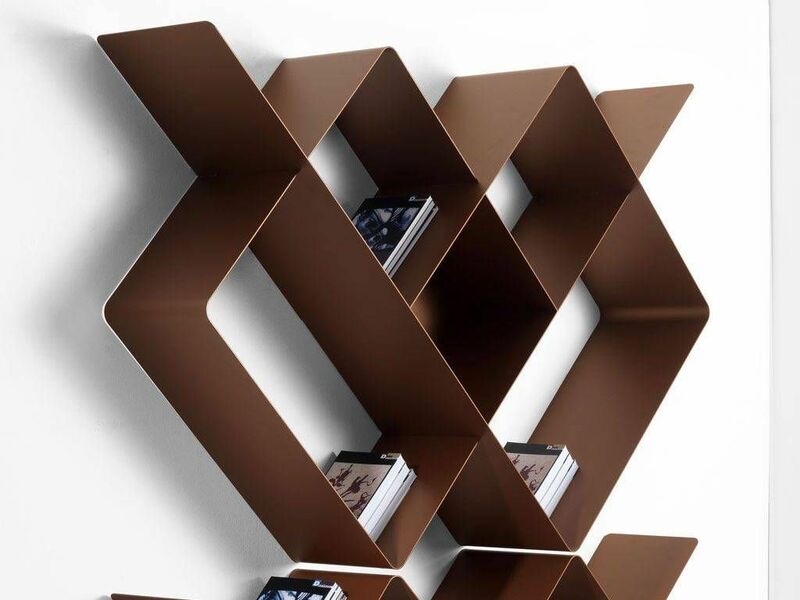 An inevitable decor element for your living room. 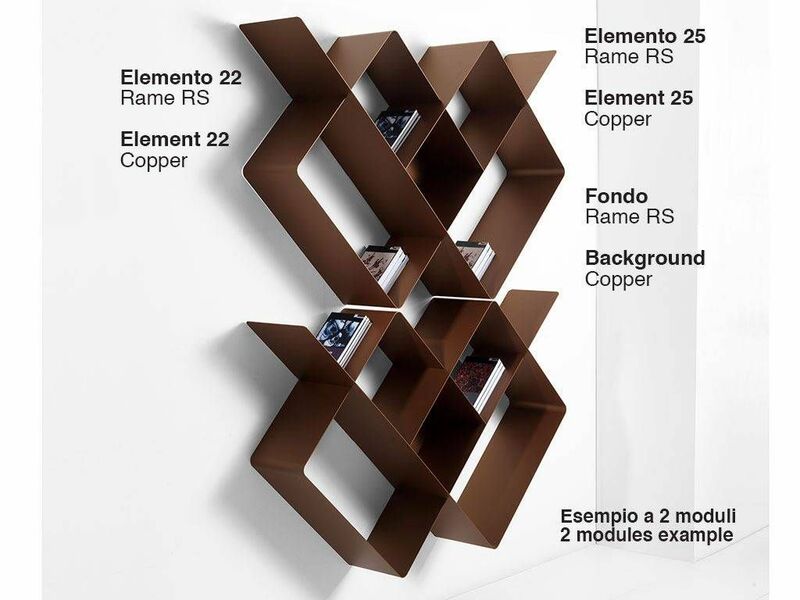 (ANY ELEMENT IN COPPER OR GOLD COLOUR EXPECTS AN ADDITIONAL COST). 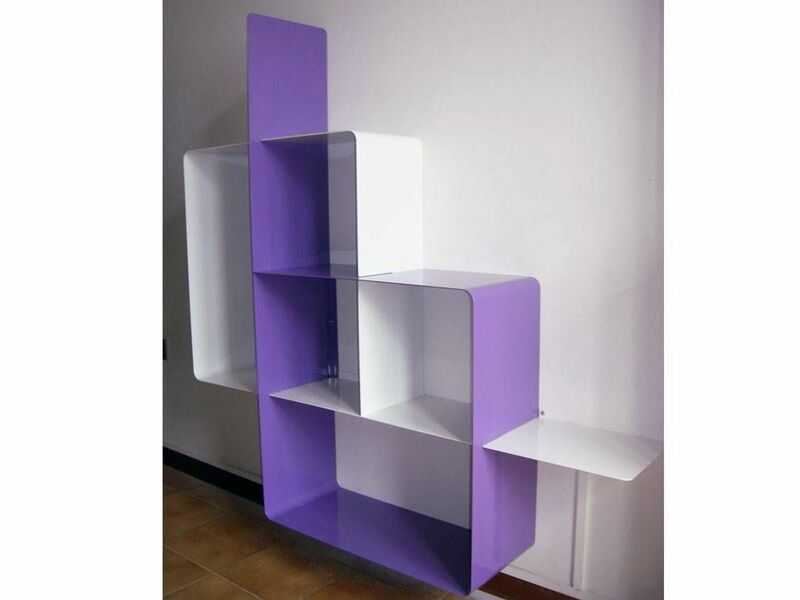 IT IS POSSIBLE TO CREATE COLOUR COMBINATIONS TO REALIZE A ONE-COLOURED, TWO-COLOURED OR THREE-COLOURED BOOKCASE. 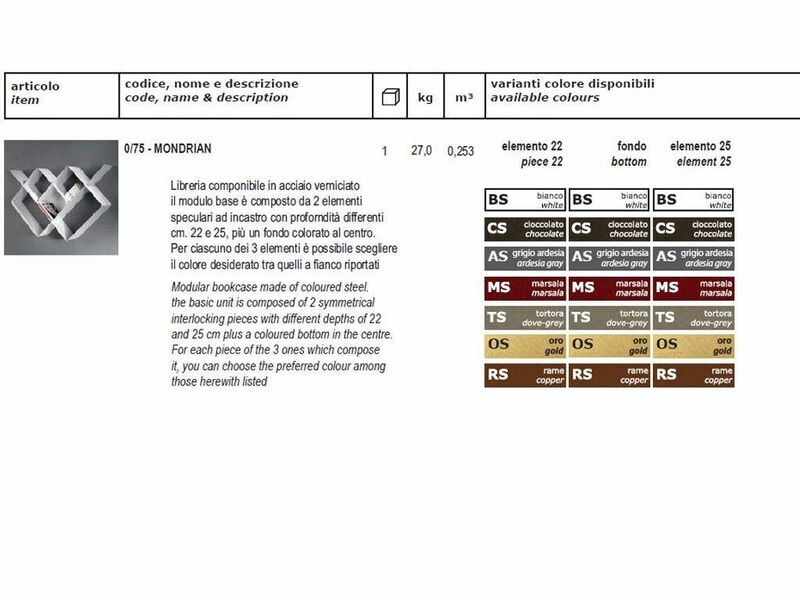 2) SPECIFY THE DESIRED COLOUR COMBINATION, INDICATING INTO THE NOTE FIELD THE COLOUR FOR EACH ELEMENT: ELEMENT 25, ELEMENT 22, BACKGROUND. 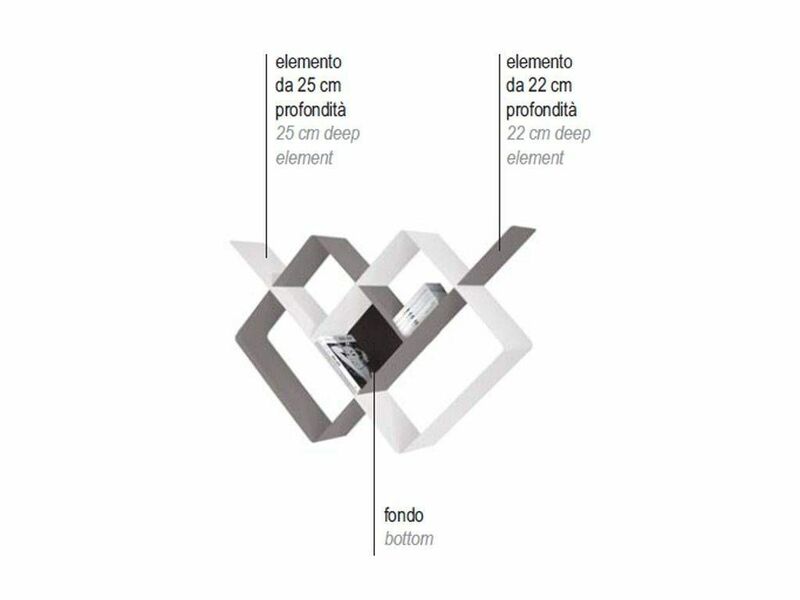 You can choose the three elements (2+ central background) which are composing the base module among many different colors , to find the combination which best matches your needs. 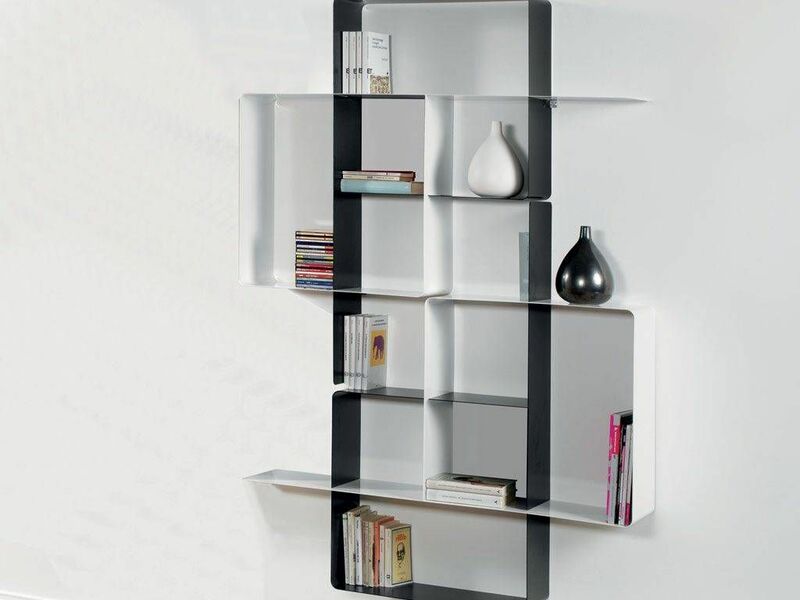 The structure is made of varnished steel and it's very resistant. 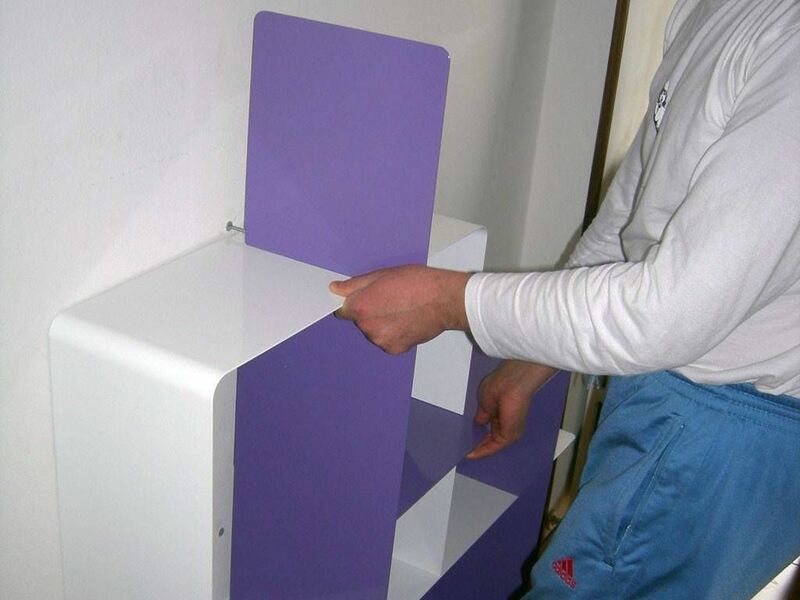 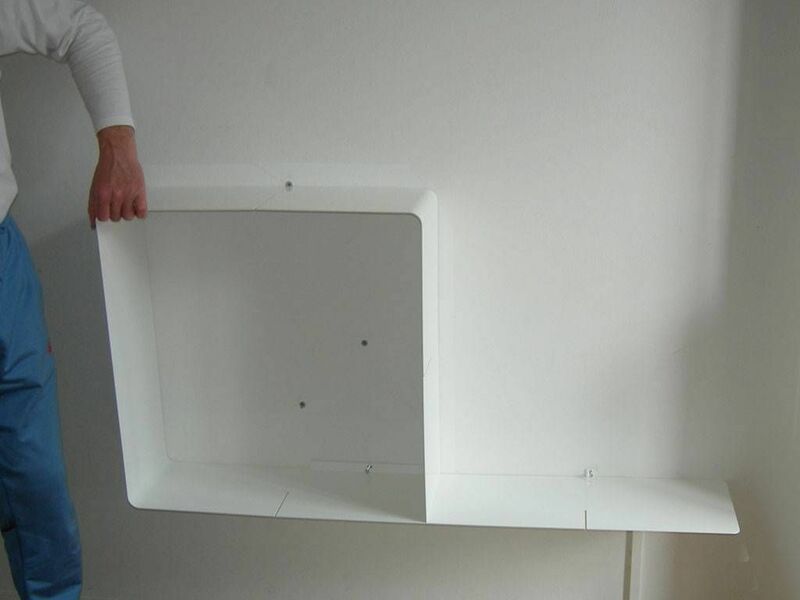 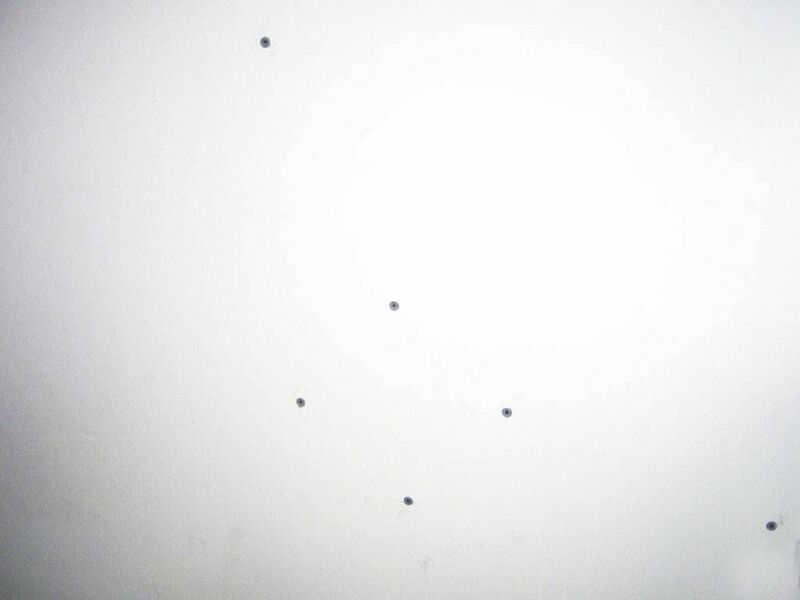 The assembling is composed by 6 fixing wall points in order to guarantee the maximum capacity. 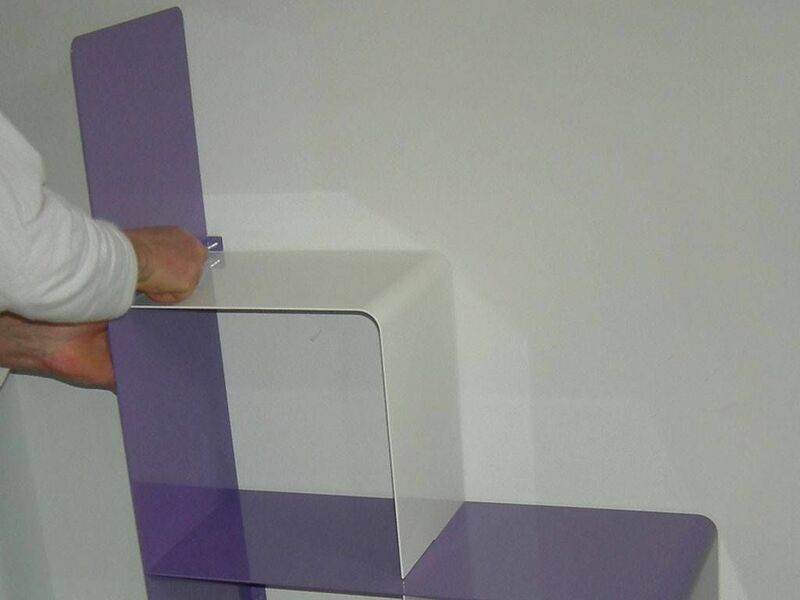 2) The fixing process and the concerning instructions have been improved in minute details. 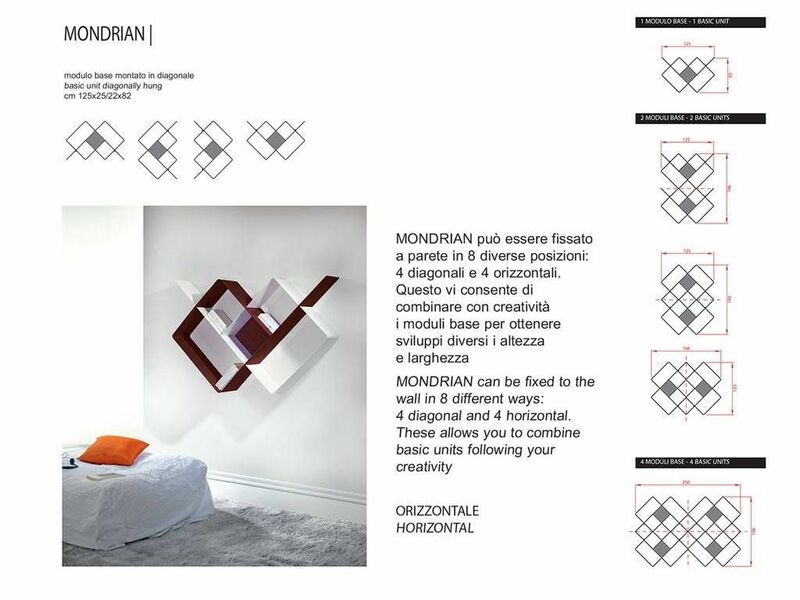 In the box of each Mondrian module you can find included the dima (drilling mask) made of cardboard attached. 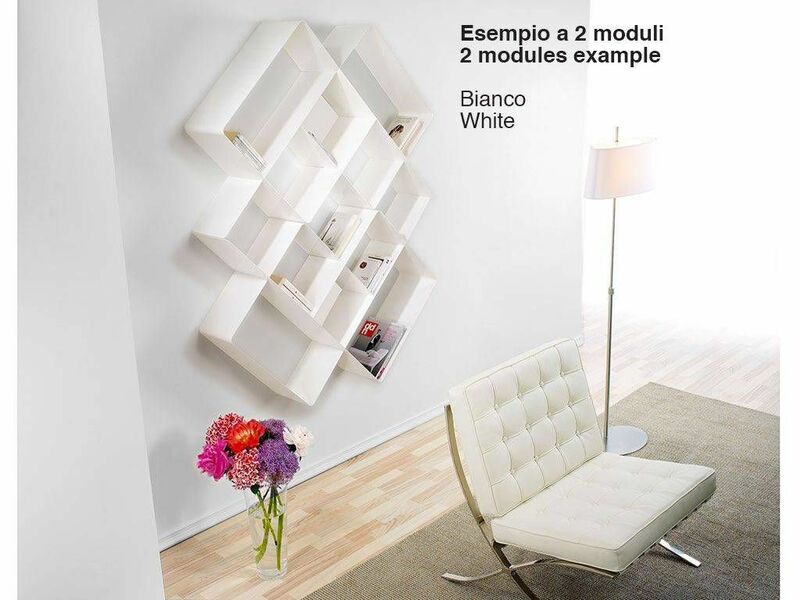 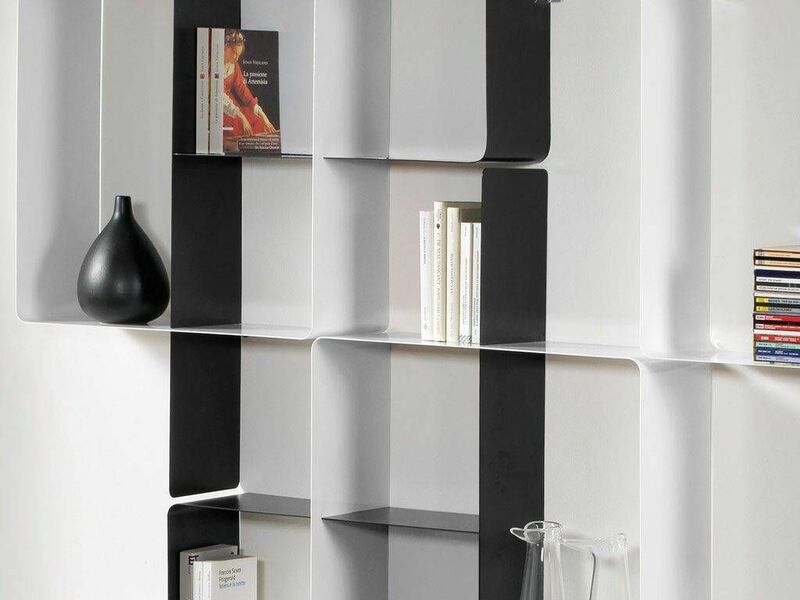 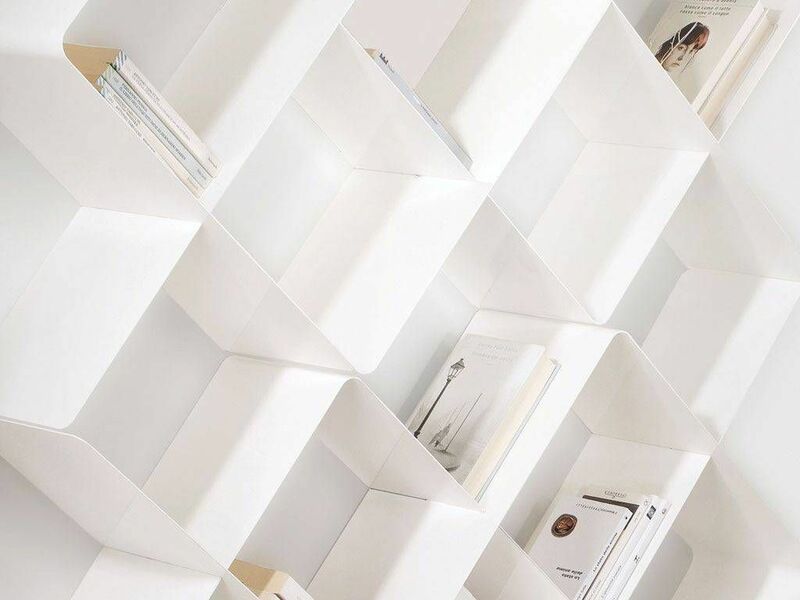 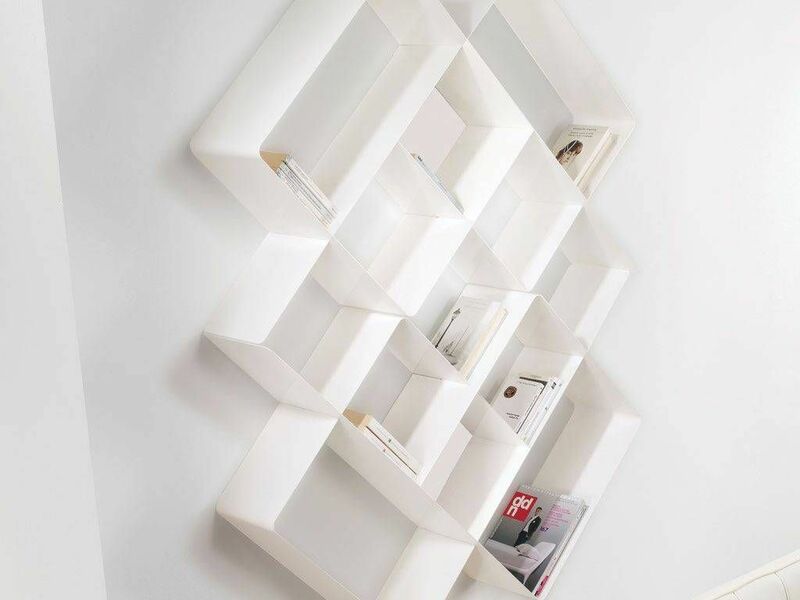 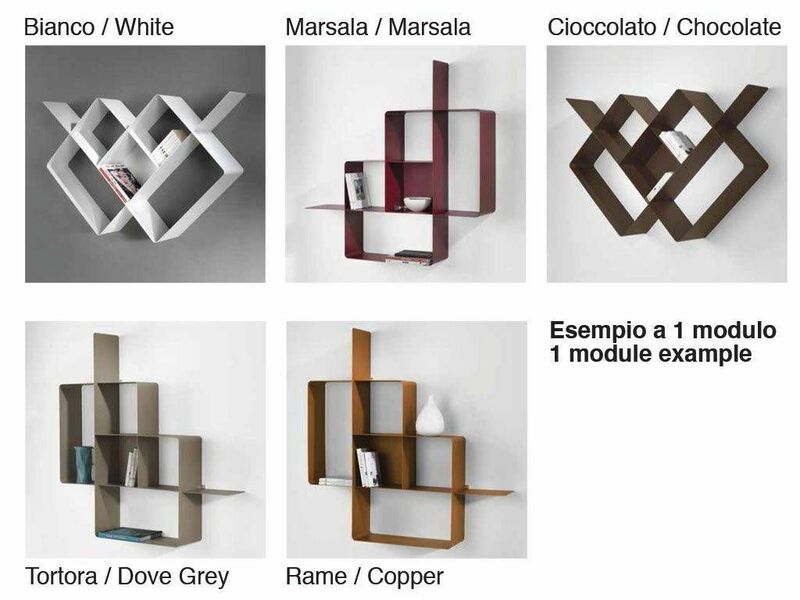 Dima is realized in 1:1 scale: it allows the disposition of the wall holes avoiding mistakes and it makes easier to fix horizontally or vertically the one-module or the multi-module bookcase. 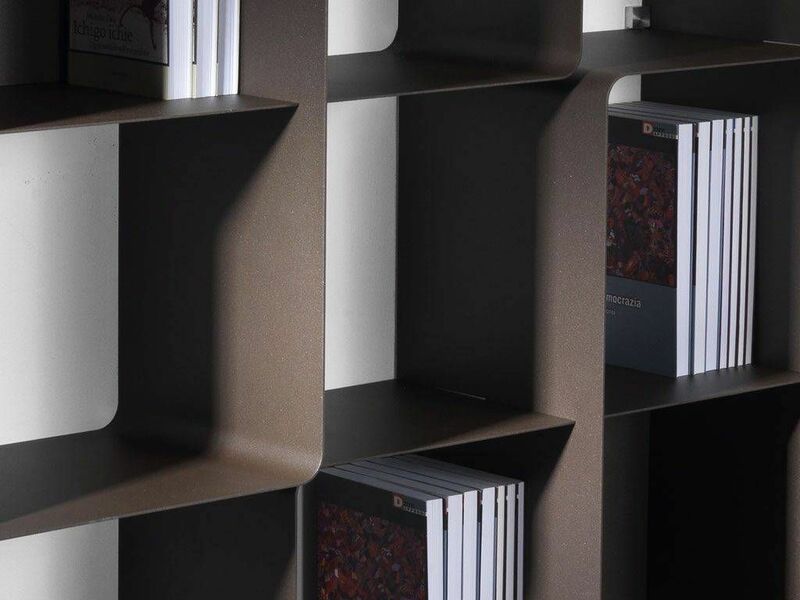 On the dima there are more instructions we warmly recommend you to read. 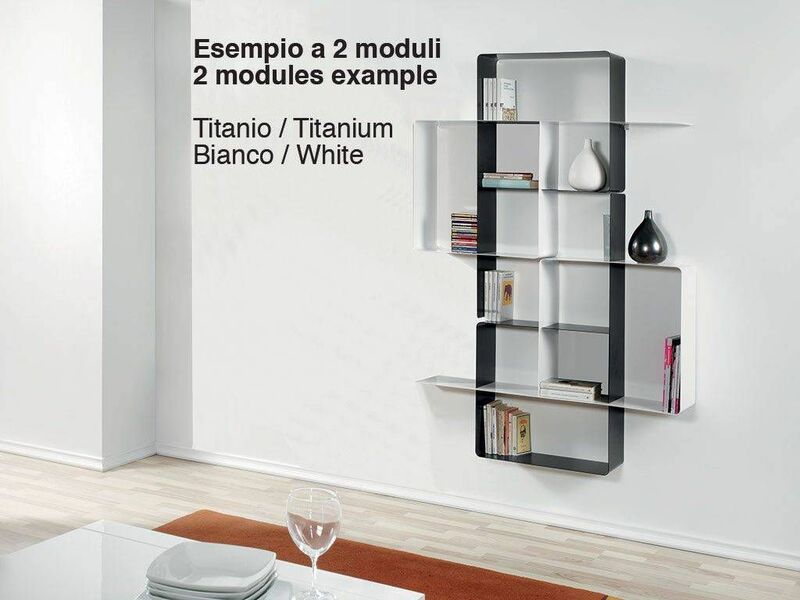 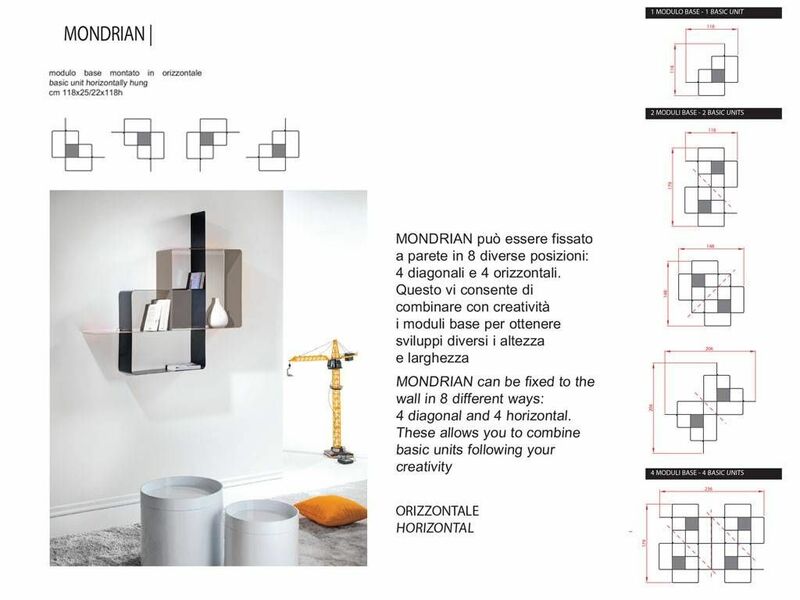 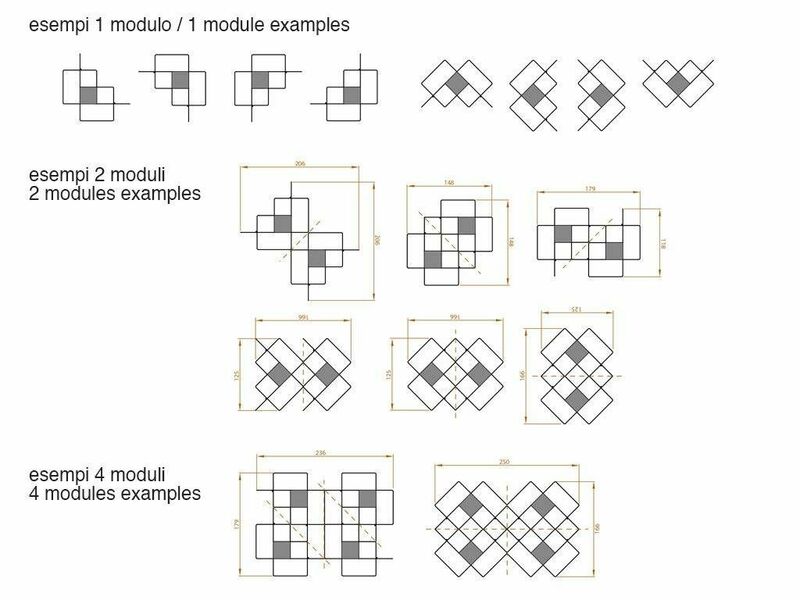 3) Each module Mondrian is provided with 6 fixing points to guarantee more than the 70 kg, (equal to the weight of 150 economic version books, which can be loaded on a single module) that is more than the capacity declared in the assembling instructions. 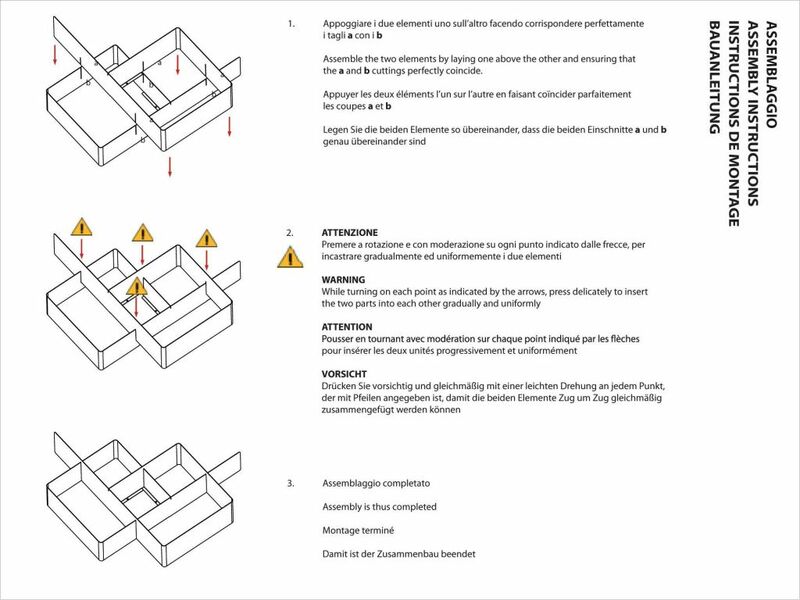 To satisfy your interest, we add that the 4 points of attachment, which are highlighted in yellow in the attached dima, would be abundantly sufficient to guarantee a strong fixing in a normal brick or masonry wall.